The doors open at 7:00 on September 30th, and the players start to get anxious, but they are confident and ready to give a great show. The group has been practicing every Wednesday at 8:00 in room 120 of Bucknall Hall, so they have been preparing for this night for quite some time now. They are all enthusiastic, especially when doing their warmups. As the doors open, the spectators fill in the seats at the Alumni lounge in Bartel’s Hall. 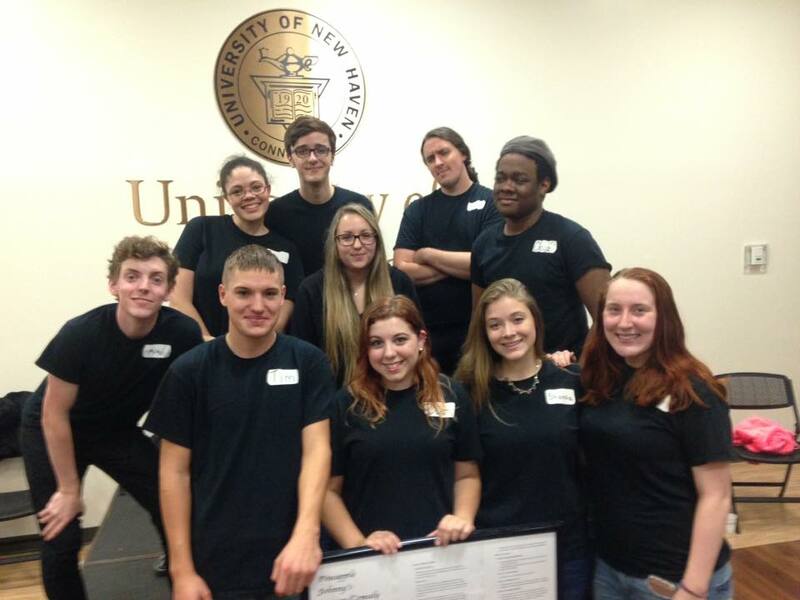 They’re all ready to see the show held by the University of New Haven’s own, Pineapple Johnny’s Improv Club. “Improvised comedy is comedy that you do not rehearse or practice ahead of time. You’re just given the scenario and you just have to go with it from there,” spoke Mary Kate Kelly, Executive Assistant and Treasurer of the club. The executive board of the group consists of Kelly, President Shonna Carlson, Vice President Dani Orlando, Sergeant at Arms Tim Gadomski, all of whom are juniors except for Gadomski, who is a senior. The top eight members of the club were chosen by the E-Board to be in the show. Back in the Alumni Lounge is a small stage with four chairs on both sides, each for the eight performers to sit on when they aren’t performing. Next to the chairs is a podium and a microphone. The podium is for a host to announce the different skits, or “games,” they have for the show. Before audience members go to their own seats, they have a chance to write down a word or phrase that would be randomly picked and used during the show. They also have a chance to write their name for a chance to be brought on stage and have a part in one of the skits. Zach, an audience member who actually had a chance to participate at the end of the show, came with high standards that were exceeded by the performances. The gang performed different “games” where they had different aspects to their routine. As is the traditional improve setup, they would have the audience shout a location, scene, or defining trait for one of the characters. The event also included two members of the group who performed a short set of standup comedy in the “spotlight” portions of the show. Some of the lines and routines were inspired by the hit television show Whose Line is it Anyway? which is also a reason as to how the group came to be. An email from the Communications Club asked for people to volunteer for a remake of Whose Line is it Anyway? where the now E-Board members came to perform. They had fun and wanted to continue performing improvised comedy, so they made a group for themselves. “From there on, we just realized that the University needed it. Everyone needs a laugh,” Carlson said. What surprised me when I first saw a meeting was the knowledge that the leaders of the group had about improvisation. The E-Board leads the meetings and teaches other members by helping them with the skits and giving them advice on how to create a scene. They lead the group, but they also treat them like their peers and friends, because most of them are friends. Gadomski emphasized the uniqueness of each improv group and performance when talking about what to expect from an improv show. The club seems to be holding up on its promise of acceptance, as new member and freshman Caleb Boure, who has never been in an improv group, is glad to be a part of the club. “I like being able to feel emotionally connected to people through something that I actually care about,” he said. The story behind the name of the club is a bit of an inside joke for the group. Pineapple Johnny’ Improv Club members had unofficial meetings before it became a group, and the name Johnny kept coming up as a character when they were performing the games. “Johnny was the bad kid at school, Johnny was the teacher, Johnny was the bus driver,” claims Gadomski. Johnny kept coming up, and not too long after, so did pineapples. Eventually, one of the members was thinking of Pineapple Johnny’s as a name for the group, and the rest agreed.